Map “Palestine: The Holy Land” by Guillaume de L'Isle (Delisle) in 1782. This map isn't part of any series, but we have other maps of the Middle East that you might want to check out. It's old favorite Guillaume Delisle, but not, this time, depicting the Mississippi River Valley. In this map he turns his attentions to the (Abrahamic) Holy Land. The map faces east, with the Mediterranean in the foreground. 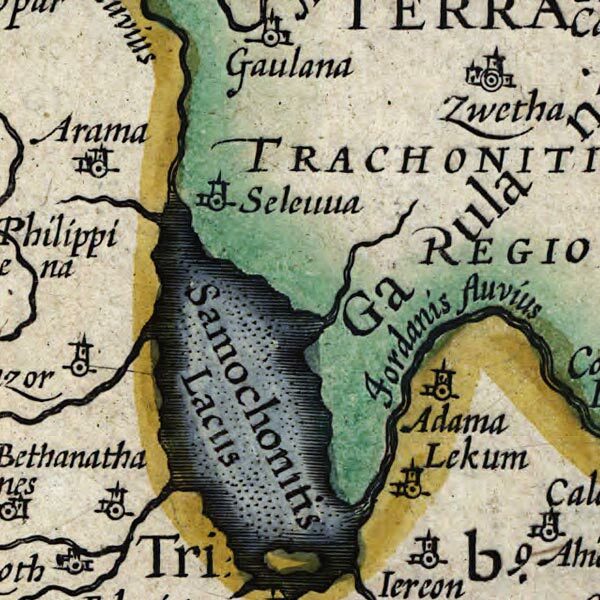 The large endorheic lake at the center right is the "Mare Mortuum" or Dead Sea [gmap], following the River Jordan north (to the map's left) we see another large water body, the "Mare Galilaeae" or the Sea of Galilee [gmap]. Nestled just north of this is a water feature that looked entirely unfamiliar to me, and when I looked it up, I found out why; the "Samochonitis Lacus" was the biblical Lake Merom which was drained in the 1950s for use as agricultural land. The work's title is ”Terra Sancta que in Sacris Terra Promissionis ol: Palestina” which I'm imagining means “Sacred Land, the Promised Land: Palestine”, but I don't speak Latin and I welcome correction (not only in this instance, but for any error you find on any description on the site... so by all means, don't hesitate). You’re not too far off the mark on the translation, I think. I get “The Holy Lands, which are in sacred lands; The Land of Promise, which was Palestine”, though the following should be borne in mind. * Terra Promissionis can, I think, be either read variously as “Land of Promise”, “The Land of Promise”, “The Land of the Promise”, or “Land of the Promise”. Latin, for better or for worse, lacks articles. (Well, at least Classical Latin does…I’m don’t know if Medieval Latin had them or not.) Strictly speaking, any “the” in my translation could be dropped, and any noun without them could be translated with it. You kind of have to fill it in from context. * In my translation I went out on a limb and guessed that the ol is an abbreviation for olim “at a time in the past; at a time in the future” (totally unambiguous, I know). I really can’t think of anything else it could be, but that’s not to say that some other word cropped up in between the Cesarean era and 1782; that just means I haven’t come across it. I’m also reading the “which” into it, as well, but that’s more for it flowing better in English–though Latin, especially in poetry, does like to drop out words on occasion. 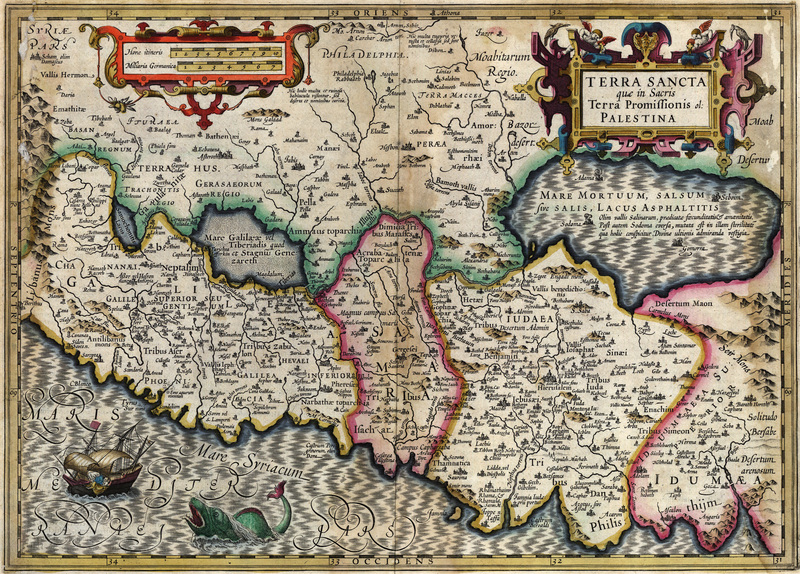 * Palestina, though used as an alternate name for the land of the Philistines, is also used as an abbreviation for the name of the Roman province Syria Palestina. Again, judging by context, I doubt that this is the intended meaning (I take it this map is supposed to be period-contemporary, or nearly so). As a tangental bootnote, “Palestina” ultimately derives from the Hebrew word meaning “land of the Philistines, Palestine”. (Interestingly, in Modern Standard Arabic, the word for Palestine is فلسطين Filusṭīn [if I’ve correctly remembered the short vowels…I might be confusing the country name with the nisba (demonym) form]), which indeed begins with an /f/. My suspicion is that somewhere along the line the there was a /p/ that gained initial aspiration and then degenerated into /f/.